At the end of last year, I took a very cold trip out to the SeaTac airport area for a writing seminar with Anne Heffron. She walked us through a lot of exercises designed to help us figure out why we would take a very cold trip out to an airport hotel on a Friday night — why we say we want to write and don’t. Why we set ourselves goals and then flounder at them. To figure out what it is that writing means to us. A weird and wonderful night, I was really grateful for the long trip back home on the light rail because it let me process enough of that night that I could sleep when I got home. And I’m writing things — not things I want to share with the world, exactly, but I feel like this outlet I’ve been toying with since elementary school actually works for me instead of against me. So Anne is doing this wonderful experiment to more fully inhabit her own skin and the life around it. Part of it involved a change of diet. Hey, I know changes of diet. I understand missing things I used to be able to eat easily! She talks often of Morning Glory muffins as a thing that has been left behind. I don’t know, honestly, if Morning Glory muffins are THAT amazing or if they are a well-named food to be brought up again and again. I’ve never had a morning glory muffin. But I looked them up, and the flavor profile sounds pretty good — apples, carrots, coconut, cinnamon. All things I like. And since I’ve been trying to mix up breakfasts lately, I decided to be inspired by Anne’s left behind food and reinvent it a bit — into overnight oats. Morning glory oats are oatmeal but with so many different textures and flavors that your mouth and brain don’t get bored. I had everything to make this oatmeal in my house already, though I will admit that I haven’t tried this with rolled oats because I am so bored of them and I’m out and haven’t restocked. Many people with celiac cannot eat oats, so I tried this with quinoa flakes, as well. I think I personally like the steel-cut oats better because of texture, but the added protein from quinoa can’t hurt. If you can’t eat one of the many add-in items here, skip it! Make it nut-free by leaving out the walnuts (and coconut, if needed). Make it low FODMAPs by leaving out the applesauce (I think that would be the only thing — but I’m not an expert on FODMAPs). Adjust it however you need to suit you or your family. This recipe is written for one hearty serving. Increase as desired. I don’t usually find the glory in morning, but I do like this oatmeal. 1/2 cup non-dairy milk I used flax milk and really liked it. Mix all ingredients together in a heat-proof container of your choice. If you can't find your shredder, like me, just peel the carrots and then keep peeling the part you want to eat, too. Chop the peeled bits. Put in the fridge overnight. In the morning, stir and add more milk if needed. Heat and eat. 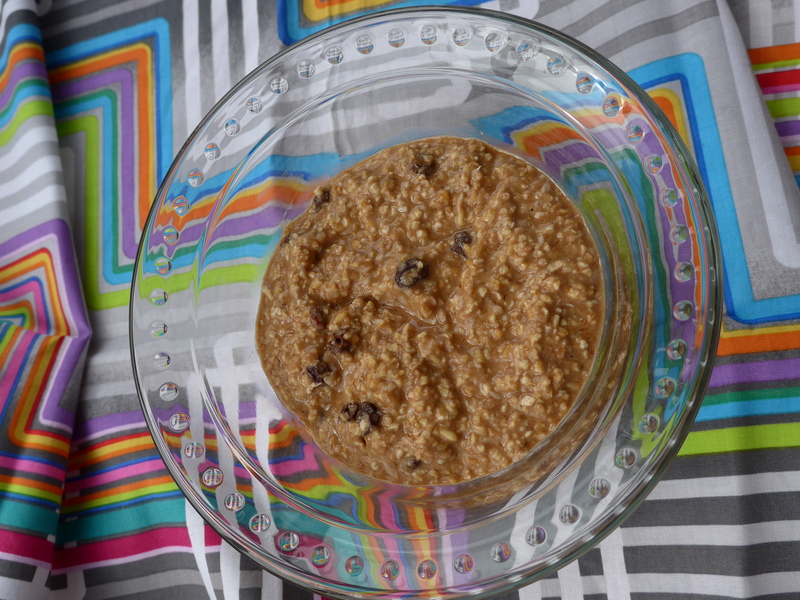 If you're using the steel-cut oats and want them softer, cook a little longer. If you've used rolled oats or quinoa flakes, just heat it. *I'm gluten-intolerant & pretty sensitive, but I can tolerate most certified gf oats. I've used steel-cut purity protocol oats here, but you could substitute rolled oats or quinoa flakes for a different texture.